I ran across this comic today, posted in an excellent piece by Andy Naselli, a New Testament instructor at Bethlehem College & Seminary, founded by Minneapolis pastor, John Piper. Naselli’s argument is that while many Christians tend to argue that their favorite Bible translation is the best, and every other translation is inferior, it would greatly help if we had some humility here. Evangelical Christians can get pretty picky when it comes to Bible translations that they implicitly trust. But one of my pet peeves is when people, who have absolutely no background in biblical scholarship, tend to think they know better than people who have been studying the Scriptures in-depth for decades. The latest brouhaha is over a new Bible translation, the Christian Standard Bible, which is a revision of the Holman Christian Standard Bible. The Holman Christian Standard Bible (HCSB) was completed in 2004, by a team of scholars, sponsored by the Southern Baptist Convention. The new Christian Standard Bible (CSB) is a modern revision of the HCSB. Critics have charged that the Christian Standard Bible, produced by conservative evangelical scholars, have nevertheless “changed” the Bible to make it “gender inclusive,” thus hiding a liberal agenda. But as I wrote a few years ago, in one of Veracity’s most widely read posts, the issue of “gender accuracy” between the ESV and NIV 2011 translations, two of the most popular translations read by Christians today, tends to vary from passage to passage. In other words, sometimes the ESV is more “gender accurate” than the NIV 2011, but in other cases, the NIV 2011 is more “gender accurate” than the ESV. I tend to prefer the ESV, but I see a number of strengths in other translations, such as the NIV 2011, and the new CSB. It is true that no scholar, even conservative evangelical scholars, operates without a personal bias. Even the best scholars can be wrong at times. Therefore, one should not take the message of the comic to mean that the average person, without a PhD, should never be able to make their own informed decisions, when reading the biblical text, in order to understand its meaning. All I am saying is that we all need a little dose of humility, and not quickly dismiss a Bible translation, simply because one or two passages in a different translation do not conform to our own presuppositions. My suggestion would be to visit BibleGateway.com, and pick some passages in your favorite Bible translation, and then compare them to something like the new Christian Standard Bible. Who knows? 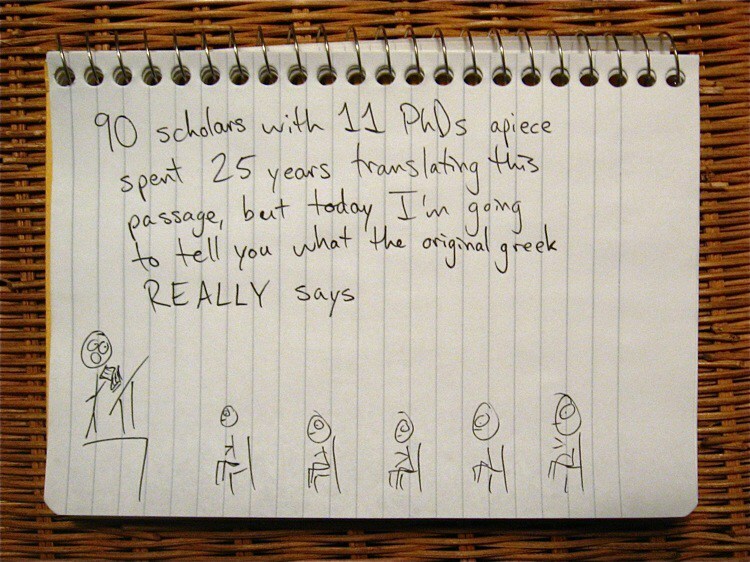 Perhaps reading something in a different translation may give you greater insight into the Bible. Here is an interview with Trevin Wax, publisher of the CSB, about the new Bible, and with Tom Schreiner, one of the lead translators, and then a brief comparison review at BibleGateway.com, with other translations. Crossway Publishers recently announced that they have arrived at a permanent revision of the English Standard Version (ESV) of the Bible. This last revision, conducted in the summer of 2016, involves just 52 words out of 29 Bible verses, as detailed on Crossway’s website. I bought my first ESV translation of the Bible in 2008. Even though the first edition came out 2001, there had been rumors of a Study Bible being produced. I am glad that I waited. This is now my favorite Bible to use, as it contains a wealth of resources and maps to aid the student of Scripture (though I also really like the Zondervan NIV Study Bible, too). Unlike some other study Bibles produced by a single Bible teacher, the ESV Study Bible was produced by a team of evangelical scholars across a wide set of backgrounds, thus making sure the reader is not limited to one person’s view of the Bible. The original vision of the ESV translation committee was to produce a modern, and yet permanent, alternative to the venerable King James Version (KJV) of the Bible, for English readers. The idea of having a fixed text that would stand the test of time was the primary reason why the church that I am a part of selected the ESV as our new pew Bible. But not every initial printing of a new Bible is perfect, and so the ESV made allowances for some changes since 2001. The largest set of changes were announced in 2011, and while I could not find those changes listed anymore at Crossway.org, another blogger at Bible-Researcher.com has still hung onto them (PDF format), 500 words out of 275 verses. Before the ESV Study Bible appeared, another set of changes were made in 2007 (If you know of any other previous changes, let me know, as I would like to link to them here). But it looks like the ESV translators are now finished with their work. Note that the “final” version of the King James Version of the Bible was not fixed until 1769, 158 years after the KJV was originally produced. ChristianityToday has an article about the summer 2016 changes to the ESV here. 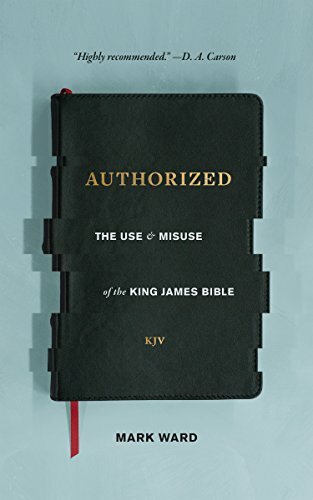 I blogged about how believers can navigate through their decision on what Bible translation they should use, the ESV vs. NIV 2011, in a earlier Veracity post. Blogger Jon Burnett details some of the recent 2016 changes. For you total Bible geeks, Old Testament professor Claude Mariottini has reviewed these changes (spoiler alert: Mariottini does not like some of the changes. One of his biggest gripes deals with an issue related to the complementarian/egalitarian debate, which is pretty current in evangelical circles and explored at Veracity here). And finally, blogger Scot McKnight addresses the most controversial change. UPDATE: September 15, 2016. Dave Rudy, a faithful Veracity follower, sent me this link to a post by blogger/theologian Denny Burk interacting with Scot McKnight, defending the ESV’s permanent revision. UPDATE: September 30, 2016. Crossway has reversed their decision. Details here. What do you get when you cross an Irish rock star with a Bible scholar/pastor? An interesting conversation between Bono and Eugene Peterson, the author of the English paraphrase translation of the Bible, The Message.